Rep. Rashida Tlaib says President Trump is NOT off the hook in Robert Mueller's Russian collusion investigation ... because she clearly doesn't trust the man who summarized it. We got the Democrat Congresswoman at Reagan National and raised the issue ... isn't it a good thing for the country if the Prez didn't collude with Putin and Co.? The Congresswoman recoiled and made it clear ... she's not convinced Trump's clean, given all we know is what his hired gun, Attorney General William Barr, said in his letter. 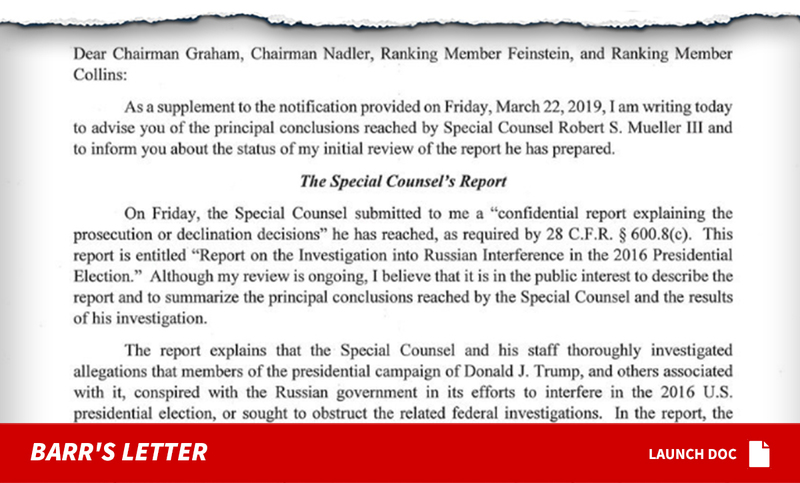 Barr did quote Mueller's conclusion on the issue of collusion ... "[T]he investigation did not establish that members of the Trump Campaign conspired or coordinated with the Russian government in its election interference activities." The unconvinced Tlaib says the only way this "dark cloud" can be lifted is for the report to be released in full, without a cushion from a Trump ally. It's interesting -- Tlaib talks impeachment with us here too ... saying Trump's misdeeds go well beyond the Russians. Next articleAre You Scared Of Tight Dresses?